1. What are your sculptures made of? My sculptures are built with water-based clay and are fired in a gas kiln to cone 4, about 2150 degrees Fahrenheit (for a specific firing schedule, see # 8 below). 2. Are your sculptures solid? My sculptures are built hollow with walls that are about 3/4 to one inch thick. I primarily use coil construction, but depending on the pose, I also use slab construction for arms and legs and solid construction hollowed out for the head. To view a video that demonstrates a quick review of this process, click here or see video at bottom of this page. 3. How much do your sculptures weigh? 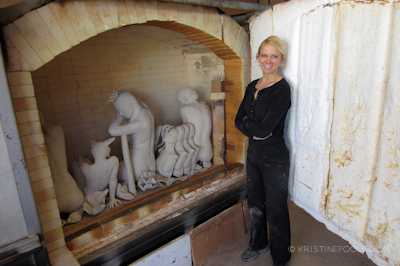 I typically use between 125 - 165 pounds of clay to build each sculpture. By the time they are dried and fired, they will shrink 10 - 20% and will usually weigh between 110 and 140 pounds. 4. What kind of clay do you use? I generally use Laguna Clay’s “Buff Sculpture Body” (WC392). This is a very sandy, groggy sculpture clay that fires in oxidation to a light yellow color and in reduction to a warm speckled buff color. While many find the coarse nature of this clay troublesome, I find it to be extremely forgiving in terms of construction techniques and firing - it is not a delicate clay body and will withstand a great deal of stress. 5. How long does it take you to build a life-sized sculpture? It usually takes me about four to six weeks to construct, sculpt and refine a life-sized sculpture. If my exhibition schedule allows, I usually let them dry very slowly for six to eight weeks. I keep them completely covered for one to two weeks, opening them for a few hours each day (at this phase, I keep head, hands, wrists and feet covered while the rest of the sculpture is open to the air - these parts will dry faster than the torso and legs if left uncovered creating shrinkage and cracking issues). I keep them loosely covered for another week or so until the clay starts to turn white (indicating drying), again uncovering them for most of the day. Once the torso and legs have begun to turn mostly white, I uncover the entire sculpture and let it dry for another couple weeks. In total, sculpting plus drying and firing will take around three months. 6. How long does it take to put the words on the sculptures? How do you do it? Inscribing the words takes anywhere from 6 - 40 hours depending on how many words are on the sculpture (4500 words - about what is necessary to cover an entire life-sized piece - takes about 40 hours). I use small wood carving gouges to impress the letters into the surface of leather hard clay. 7. Do you use body casts? I do not use body casts. My pieces are all sculpted from models and reference photos. I have molded a torso I sculpted and use this to create "test tiles" as seen in the image above. 8. What is your firing schedule? I definitely err on the side of caution in the firing. Large scale works can crack if fired to quickly, so I tend to baby them along. Firing schedule: Day one: load sculptures into the kiln, leave the door cracked open about 10" and keep the temperature at 180˚F or just below. Day two, 7 AM: 125˚F/ hour to 500˚F. 150˚F/ hour to 900˚F. 125˚F/ hour to 1100˚. 175˚/hour to temperature. Yes, I have over 20 years of teaching experience, working one on one and also with groups. I offer workshops, both private lessons in our Santa Fe studio as well as group workshops at universities, colleges and clay clubs. I am also in the process of setting up the structure to offer small group cyber workshops. If you'd like to be kept informed of my workshop schedule, please email me or use the contact form and indicate that in the comments section.